Collaboration is a core value and organizing structure of Whose Knowledge?. We can only build an internet for everyone by working together with partners and allies, so we amplify, remix, and openly share all of our ideas, initiatives, and campaigns. We draw from and build on the powerful efforts of other organizations and communities working toward reimagining the internet, and we initiate projects and campaigns that are both inclusive and adaptable. Knowledge belongs to everyone, and so do our contributions to it! We are humbled and honored to share this mission and this space with extraordinary grassroots movements, communities, and campaigns that are transforming the internet in this very moment. We are activists, dreamers, and (most importantly) allies. And we seek to amplify our shared message to the world: the internet is for everyone, and should be from everyone. These are some of the community action groups we have partnered with and support. 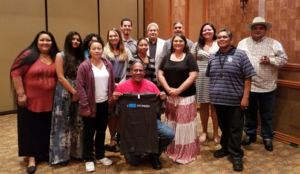 The Kumeyaay-Wikipedia Initiative was developed through the efforts of Kumeyaay educators Michael Connolly Miskwish and Stan Rodriguez. We’ve been collaborating to map knowledge gaps and preferred sources for adding Kumeyaay knowledge to Wikipedia, and learn more about the tensions between indigenous knowledge and Wikipedia’s norms and values. The group is continuing to explore a range of topics today, from using Wikipedia in their classrooms, to documenting oral histories online.